Synopsis Shot on location at Beach House Park, Worthing, England, this video provides an hour of tuition, advice and above all, entertainment, from the top stars of the game. 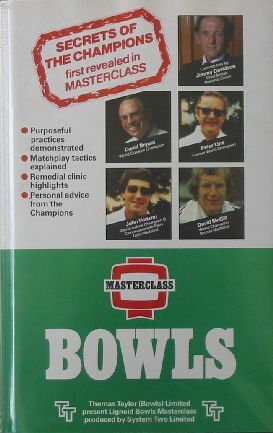 Sponsored by Thomas Taylor (Bowls) Ltd, Bowls Masterclass is designed to help make the very best of your game - and increase your enjoyment whether you're an enthusiastic novice or an experienced player. Grips are shown in close-up detail. Stance, backswing and follow-through are fully demonstrated and their effect on line and length discussed. Weight control and rink judgement are covered and the champions reveal their own match play tactics with explanations of shot selection and strategies.